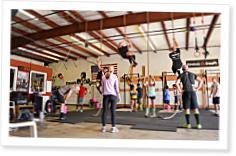 CrossFit affiliate owners are free to run their businesses any way they like as they pursue excellence and bring fitness to their clients. They can make their own decisions as to how they integrate new clients into the gym, whether they’re going to offer specialty programs, how they’ll develop and compensate coaches, how much they’re going to charge, what hours they’ll be open, whether they’ll install showers, and so on. CrossFit’s “least rents” model of affiliation is the entrepreneur’s dream, where a gym owner pays a relatively low annual fee (US$3,000 for most gyms) for the use of the CrossFit name but is free to run the business as he or she sees fit. In more than 6,000 businesses around the world, affiliate owners are taking advantage of the opportunity to decide for themselves what works best, and the result is a constantly growing community of healthy people and businesses. This series looks at the business of running a CrossFit box and examines what different CrossFit affiliates are doing to create excellence in their clients, their coaches and ultimately their gyms. The affiliates in this series have been around for some time and have implemented the results of successful experiments and learned from the things that didn’t work. Interestingly, different affiliates are having similar levels of success with opposite approaches. The first installment in this series looks at three contrasting ways to integrate new clients and keep them around for the long haul. Will these approaches work for your gym? That’s for you to decide. Great piece! I wonder what the retention rates were after each style of OnRamp? Did any measure? Wonderful article! Just received affiliation approval, and found this very interesting and helpful. Looking forward to the rest of the series!